Click the search icon at the top of the screen. Type the search key into the text field. Click Go or hit Enter on the keyboard. The search returned 28 records, two of which are Accounts, two are Contacts, six are Magento Shopping Carts, etc. You can scroll through the entire list of results or select a specific entity in order to find the desired record faster. To save time, you can limit a search by a certain entity. For example, if you know you’re looking for a certain account, you can look for “Ann” in Accounts only. 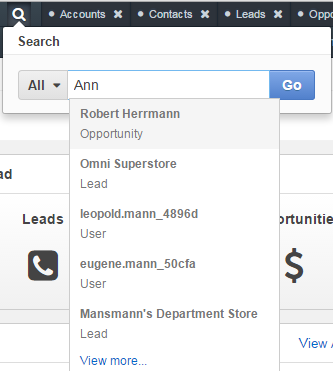 In order to see all the records with a specific tag anywhere in the system, you can search by tag. You will see a page that looks similar to the search results and that contains all the records with this tag.